“There are no elections in Gujarat now. Odisha’s elections are coming up and that is why after 19 years the CM has remembered Odiyas settled in Gujarat. I welcome him to Gujarat,” Rupani said. Gujarat Chief Minister Vijay Rupani, on a visit to Bhubaneswar on Monday, criticised his Odisha counterpart Naveen Patnaik for his visit to Surat for a programme with the resident Odiya population. Surat is estimated to have around seven lakh Odiyas, mostly from Ganjam district, under which Patnaik’s own Assembly constituency of Hinjilicut falls. Rupani also criticised the Odisha government’s refusal to join Ayushmaan Bharat. “The Centre makes programmes for the people’s benefit, not for political agendas. I am surprised Odisha is not joining Ayushmaan Bharat,” he said. “In Gujarat, we had Amrutum Yojana and Vatsalya Yojana before Ayushmaan Bharat. We used to reimburse medical bills up to Rs 3 lakhs in these schemes. Like Biju Swasthya Kalyan Yojana (the BJD’s programme), we used to serve people and issued cards to 40 lakh people and spend Rs 1,000 crore,” he continued. “Ayushmaan Bharat will work across the country. However, BSKY or our Gujarat scheme won’t work outside our respective states,” he added. Rupani’s statement about Patnaik travelling to Surat echoed statements made by BJP leader and Union Minister Dharmendra Pradhan, and Leader of Opposition Narasingha Mishra (Congress), who have questioned the timing of the visit. Pradhan, who had attended an event by Odiyas settled in Surat along with the Gujarat CM in September, on Sunday had accused Patnaik of “shedding crocodile tears… because Odiyas in Surat have made up their mind to come to Odisha and Ganjam and remove him from government”. 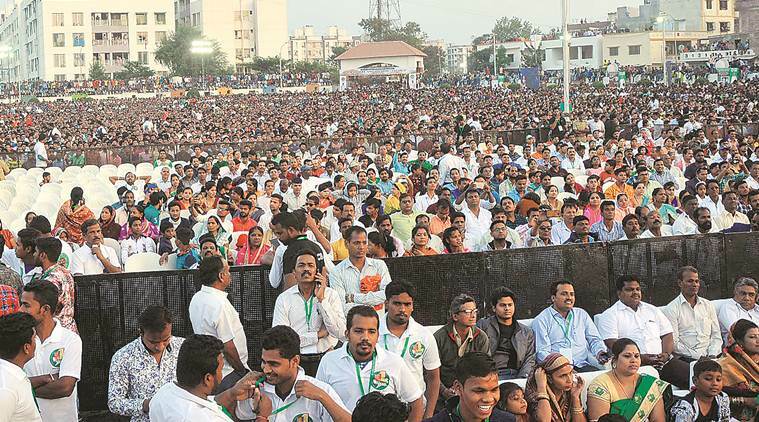 Meanwhile, Patnaik, who addressed a huge gathering in Surat, said that all migrant Odiyas would be now covered under Biju Swasthya Kalyan Yojana, the Odisha government healthcare scheme that provides an annual cover of Rs 5 lakh per family and Rs 7 lakh for women members of the family. “The scheme is not limited to APL and BPL categories,” Patnaik said. He also announced a Rs 10-crore fund for setting up an Odisha Cultural Centre in Surat, and promised to set up a high school for those who have cleared Class X from Odisha education board. “The sisters and brothers of Odisha have contributed immensely to the development of Gujarat and Odisha,” he said. He said he would urge the Centre to start a direct flight from Surat to Bhubaneswar and a direct train to Berhampur. Patnaik was accompanied by several ministers from his government and at least two dozen filmstars from the Odiya film industry.